Theme-based restaurants and parks are passé. A theme-based crematorium is the latest talk of the hour, both online and offline. Antim Udan Moksha Airport in Gujarat, the first of its kind in India, puts the departing souls of the dead cremated here on international flights to the heaven for ultimate salvation or moksha: freedom from the cycle of birth and death. 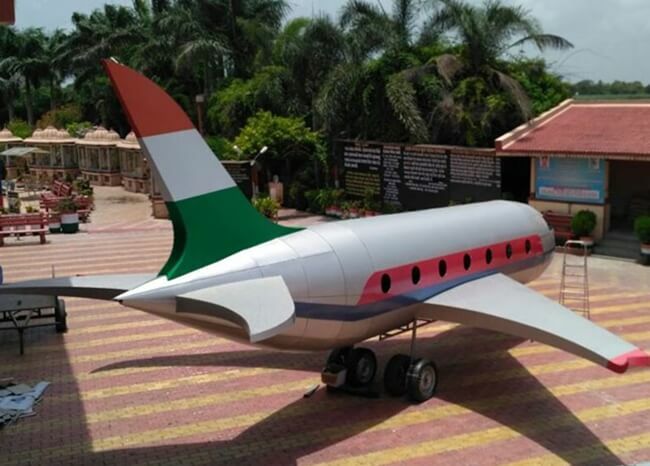 Located in Gujarat’s Bardoli on the banks of Mindhola River, the crematorium is modeled on an airport and equipped with two giant replicas of aircraft. The airplane replicas at Antim Udan Moksha Airport in Gujarat are named Moksha (salvation) airlines and Swarga (heaven) airlines which seem to transport the souls from the earth to the heaven on cremation of dead bodies here. What’s the most interesting about Antim Udan Moksha Airport in Gujarat is the airport-like announcement which is made to guide funeral parties on entry into the crematorium and instruct them where to keep the body, how to proceed for cremation, etc. There is very little difference between the announcement made at the crematorium and that at airports as well as in planes. What makes the crematorium more like an airport is the typical noise that an aircraft makes while taking off. A similar noise is created when dead bodies are placed in furnace at Antim Udan Moksha Airport in Gujarat. The atmosphere of the airport-themed crematorium is intended to soothe the mourning family members under the impression that the dead depart for salvation in the heaven. Somabhai Patel, the President of Antim Udan Moksha Airport, says that he wants the people of Bardoli to recognize the crematorium as a salvation airport where the souls take flight to the heaven from once dead bodies are cremated. People from 40 villages in and around Bardoli come to the airport-themed crematorium for the last rites of their dear and near ones. The word ‘crematorium’ sounds harsh and signifies a hard-hearted reality that everyone is destined to meet with, according to Somabhai Patel. That is why; it is replaced with the word ‘airport.’ Antim Udan Moksha Airport has five furnaces including 3 electric furnaces and 2 traditional funeral pyres. Indian Eagle is a leading travel organization booking cheap international flights to Ahmedabad, Delhi, Amritsar, Kolkata, Chennai, Hyderabad, Bengaluru, Mumbai, Jaipur, Goa and other cities in India. The lowest airfare, along with the best service is guaranteed at Indian Eagle.